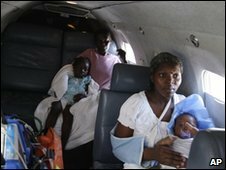 The US military says it has resumed emergency evacuation flights for critically injured victims of the Haitian earthquake. Airlifts stopped last Wednesday after Florida's governor said his state's medical system was being overwhelmed. Space at hospitals in the US and abroad has now been found, officials say. Meanwhile, some Haitian children identified as orphans by a group of Americans who were taking them abroad may have parents, it has emerged. Doctors had warned that scores of people would die unless the emergency evacuation flights resumed. "The resumption of flights was based on identifying locations where the injured could go to, where they wouldn't overwhelm the capacity of the states where they were being evacuated," US army Col Gregory Kane told reporters in Haiti's capital, Port-au-Prince. He said a flight had left on Sunday and a US medical official said another flight was being prepared for Monday. White House spokesman Tommy Vietor said the US had expanded "access to additional facilities" in the US and abroad to treat the earthquake victims. He said the hold-up in evacuation flights had been due to "logistical issues" rather than medical costs, as had been reported. "Having received assurances that additional capacity exists both here and among our international partners, we determined that we can resume these critical flights," he said. Hundreds of patients with spinal injuries, burns and other wounds have been flown on US military planes to America since the quake. More than 500 have been treated in Florida. Last week, Florida Governor Charlie Crist warned President Barack Obama's administration that the state's healthcare system was "quickly reaching saturation". Mr Crist also asked the federal government to activate the National Disaster Medical System, which usually pays for victims' care in domestic disasters. Separately, the UN's World Food Programme (WFP) has begun a large-scale distribution of aid at 16 sites across Port-au-Prince, aiming to feed two million people. Only women will be allowed to collect the 25kg (55lb) rice ration, enough to feed a family for two weeks. The WFP says food is more likely to be shared equally within a family if it is given to the women. And, many schools in areas of Haiti outside Port-au-Prince re-opened on Monday for the first time since the 12 January earthquake. Meanwhile, Haitian legal officials have been considering how to deal with 10 Americans who were stopped at Haiti's border with the Dominican Republic in a bus with 33 children. The five men and five women from Idaho-based charity New Life Children's Refuge face possible charges of child trafficking. 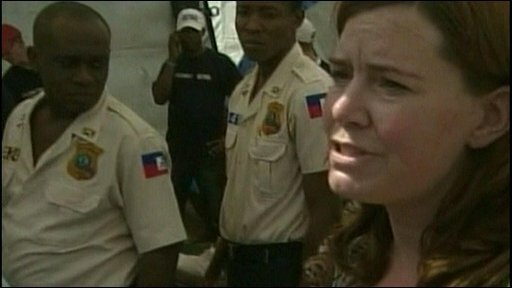 Laura Silsby, the group's leader, said they had the required clearances from the Dominican authorities, but admitted they had not obtained the proper Haitian documents. She said they were simply trying to help the children by taking them to an orphanage in neighbouring Dominican Republic. Communications Minister Marie Lassegue said it was possible the 10 could be tried in the US rather than Haiti because of the damage the earthquake caused to the country's courts and judicial staff. The children have been taken to an orphanage run by the international charity SOS Children's Villages. Charity spokesman George Willeit said at least one of the 33 youngsters, a little girl, insisted her parents were alive. He said the girl thought she was being taken by the Idaho group to a boarding school or summer camp. Mr Willeit also said many of the children had been found to be in poor health, hungry and dehydrated. Haiti has imposed new controls on the movement of children over fears that orphans are particularly vulnerable to being abducted and sold for adoption. Correspondents say Haiti's adoption regulations are clear - each case must be approved by the government.